This was the play where Zach Ertz suffered a displaced rib. In the Philadelphia Eagles' last two games against the Chicago Bears and Pittsburgh Steelers, the Birds were without TE Zach Ertz and CB Leodis McKelvin. Both players will likely play this Sunday against the Detroit Lions. "I’m doing great," said Ertz, who displaced an upper rib near his shoulder in the first game of the season against the Cleveland Browns. "I got an MRI this morning. They saw what they needed to see. I’m very excited. Obviously, we took our time with it, being very cautious with everything, but I’m where I need to be and I’m excited for this week. I had a full practice today, ready to go." When asked if he is 100 percent, Ertz confirmed that he is. "100 percent, yeah," he said. "Obviously with the bye week being where it was, it was a big help for me in particular. A lot of the guys who were banged up love it. I’m ready to go on Sunday." 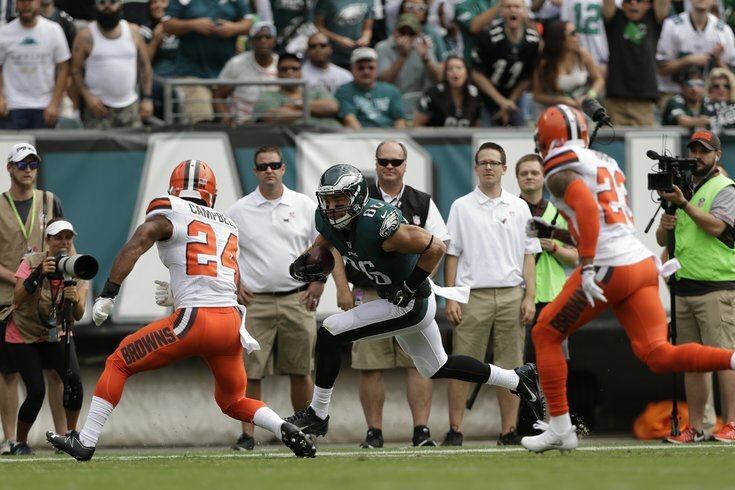 Ertz said that his injury is not one that is likely to have a recurrence. He said, "It was such a freak injury. It was the first time I’ve ever really seen it, but they’re very confident that it’s not going to happen again." McKelvin, who has a hamstring injury, was not as emphatic as Ertz about his return this Sunday, but he thinks he'll be a go. "I went out there and practiced today. It felt pretty good to me, so that’s a good sign coming in for this Sunday," said McKelvin. "I was a full participant today. It was a light practice today, so hey, it’s still running around. It was a light practice probably when I strained it. We’re going out and testing it out. It felt good today. We’ll come back Wednesday and test it again." McKelvin did not think he would have been able to play Week 4 if the Eagles did not have a bye. "I don’t think so, he said. "I would have pushed for it, but I wouldn’t want to injury anything further and be out longer in the season, so the bye week came at the best time for me, thank the Lord."